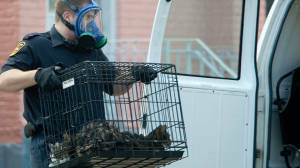 At least 50 sickly cats have been rescued from a Hamilton house owned by a board member for the Toronto Humane Society elected after the animal-welfare group weathered allegations of mismanagement and animal cruelty last year. The shelter was closed in April as part of a court-approved agreement between the THS's previous board of directors and the OSPCA. Late last year, the OSPCA raided the shelter, arrested five senior managers and charged them with animal cruelty. All charges have since been dropped. On May 31 the organization voted in Ms. Sinkins and 14 other new board members, all running on the Faces of Change slate, who promised to change the way things are done at the THS. Garth Jerome, executive director of the THS, said he was unaware of Ms. Sinkins' Hamilton home until this week and hopes the incident doesn't detract from efforts to restore the organization's reputation. Shortly after her election, Mr. Sinkins put her Hamilton property up for sale. She hopes to sell it as soon as Mr. Gould leaves. Late Tuesday night, she had found a new home for the Hamilton cats and was leading OSPCA officials there as she spoke to The Globe.